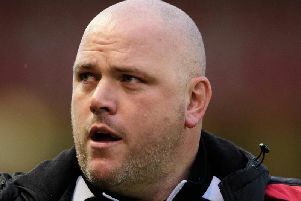 Jim Bentley was left to rue yet more injury misfortune following Morecambe’s 3-2 defeat against Bury on Saturday. Losing was bad enough for the Shrimps’ boss but he also saw Sam Lavelle and Andrew Tutte both depart injured within two minutes of each other in the first half. Their early exits meant that Morecambe’s list of injured players went into double figures with the Shrimps’ coaching staff now missing 11 of their squad. Lavelle and Tutte have now joined Barry Roche, Andy Fleming, Vadaine Oliver, Aaron Wildig, Liam Mandeville, Lamin Jagne, James Sinclair, A-Jay Leitch-Smith and Kyle Hawley in needing treatment. Alex Kenyon and Zak Mills, as well as the recently released Florent Cuvelier and Garry Thompson, have also spent time on the treatment table this season as Bentley tries to put out a team capable of avoiding the drop. That may be easier said than done as Morecambe’s infamous training ground issues mean some players are more able than others to deal with working on different surfaces. All in all, it will not be the ideal build-up for a crucial game at Port Vale on Saturday. Bentley said: “I know I get criticism for being too positive or being too negative but I always deal in facts and I say it as I see it. “That’s what I do but people keep telling me they (injuries) are part and parcel of the game, so what do we do? “We aren’t helped with regards to where we train because we have some players who adapt and some who don’t. “We have Vadaine Oliver who has been complaining of a sore knee and he’s had to drop out quite a few times. “A-Jay Leitch-Smith struggles like mad with his lower back and Sam Lavelle has a hip adductor. “We’ve got Andrew Tutte up to speed but he has a hamstring and Liam Mandeville rolled his ankle on it the other day. “I’ll continue to give it my absolute all but it’s not ideal; injuries may be part and parcel of it but we’ve had an unbelievable amount this season. “Zak Mills, Barry Roche, Vadaine Oliver, A-Jay Leitch-Smith, Andy Fleming, James Sinclair, Lamin Jagne; it’s been one thing after another.